There is a specific reason I took this photo. Not that my Halloween costume is a big mystery, but for those who don't know, this serves as a clue. (A couple of days ago, I posted a close-up of one of the buttons on the costume). Incidentally, this is a mini-plunger that I got from Misti at last weekend's Yelp pie eating contest. She had a bag of them from Repurpose America (GreenerVegas.org) - an organization that takes unwanted materials from conventions (for example) and tries to repurpose them. 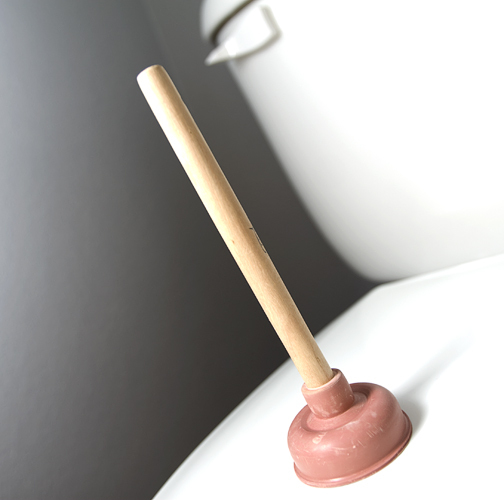 In this case, how can you repurpose something as useless as a mini-plunger? Also, the title is a reference to a joke used by the Blue Man Group. For a toilet photo, I actually kind of like this one.